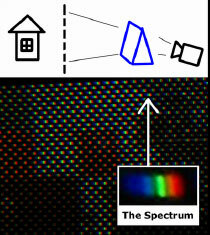 To design a multispectral video camera, capable of capturing videos of high spectral resolution. 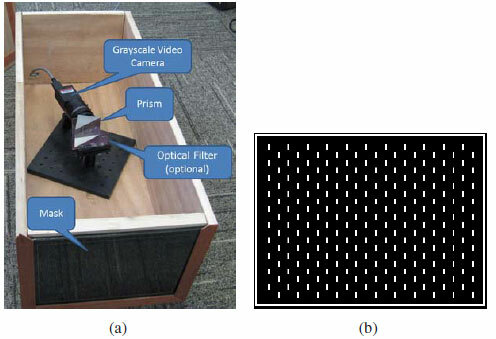 In this paper, we propose a prism-based system for capturing multispectral videos. The system consists of a triangular prism, a monochrome camera, and an occlusion mask. 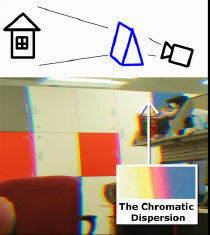 Incoming light beams from the scene are sampled by the occlusion mask, dispersed into their constituent spectra by the triangular prism, and then captured by the monochrome camera. Our system is capable of capturing videos of high spectral resolution. It also allows for different tradeoffs between spectral and spatial resolution by adjusting the focal length of the camera. We demonstrate the effectiveness of our system with several applications, including human skin detection, physical material recognition, and RGB video generation. (a) A prism disperses an incoming light ray into its spectrum. The dispersed spectra of neighbering rays overlap one another and become difficult to separate. (b) With an occlusion mask, the spectra of the rays that pass through the mask holes are separated and distinguishable in the recorded frames.